Back when this blog was in nappies Margheri was it’s first real success story. I went with my mate Jim on a Saturday night when there was just him and I, along with another table of two. 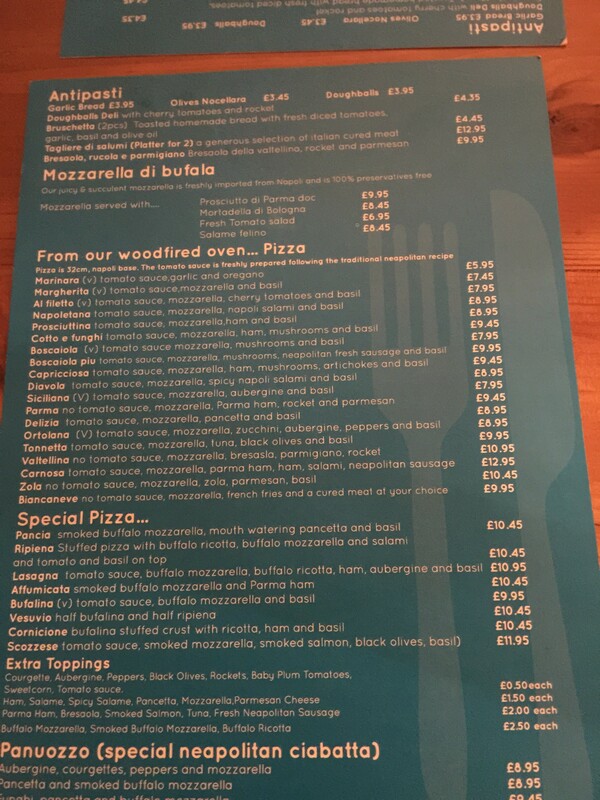 I was blown away by the quality of the food, wondering why, at that time at least, I would have to come to Lichfield to get great pizza. I wrote nice things about it and, for the first time in my life, it did some good. People went. Lots of people in fact. They sent me a lovely message telling me how they were in the enviable position of turning tables away at the weekend. In truth it had little to do with me: food this good was always going to reach its audience eventually; I was just in the right place at the right time to drop the proverbial Mentos into the neck of the Cola bottle. Since then I’ve been back maybe half a dozen times. Usually before the boxing evenings Jim hosts at his home, and always involving copious amounts of limoncello accompanied by the sort of piss-poor behaviour that happens when you’re old and don’t get out enough. It’s great, and I should shout about it more often, but I’ve wrote about it already. Except I should shout about it again. That first post, one of my most popular at the time, maxed out at just under 800 views. To put it in perspective I often pass that number in a day, my most average of posts get multiples of that, and the more popular many times that figure. It’s time to tell you once again that Margheri is really, really, really good. This time we add Fritturini to the usual Deli Doughball starters. The basket contains a variety of beige domes that only reveal their identity once bitten into. There are textbook arancini, potato croquettes with heavily seasoned mash, and balls of cheesey pasta that are new to me. It’s Italian streetfood served in the quiet town of Lichfield. The dough balls are still excellent; crunchy exteriors giving way to the same dough that makes up those oh-so-good pizzas I’ll shortly get to. The rocket and tomato salad on top tastes of both ingredients; a minor miracle given this is the end of January. Now those pizzas. I think it may be the best pizza I’ve eaten in the UK. It’s all here; the 00 flour dough that stretches out slowly like the holes of an old belt, the tomato base made from the San Marzano variety, and the buffalo mozzarella, all imported from their home region: the commitment to a true Neapolitan pizza experience has rarely been greater. On this occasion we share a Calabrese that has fiery ‘nduja and fresh basil leaves, and a special with parma ham and an entire bulb of burrata that oozes heavy cream when pierced. Both have dough blistered at a soaring heat that leaves more leopard spots than a Lilly Savage tribute act. Both have that slightly soupy centre. Both are really, really excellent. I’ve never had dessert here, unless you count limoncello as dessert, in which case I love dessert here. The bill on this occasion is £90 between five, a figure that doesnt require the accountant amongst us to declare as a bargain. For something so simple good pizza is difficult to find. 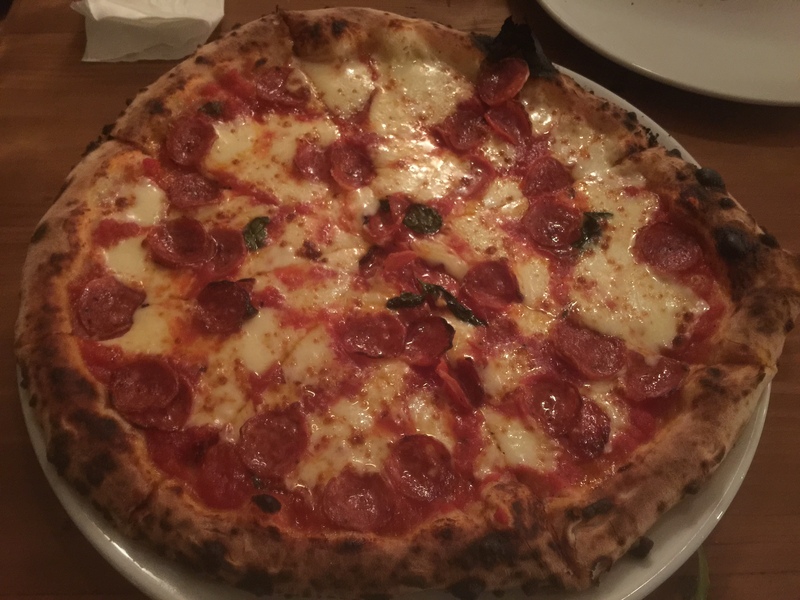 After writing this food blog for what feels like an eternity I can recommend only three in Birmingham, another three in London, one in Bristol, and Margheri in Lichfield; maybe the best of them all. The Wine House stands on the site of what was Joe Delucci’s, an horrific sounding place where, I am told, barbaric things happened to cows that should be punishable with a lengthy sentence in one of Her Majesty’s hotels. I never went to Delucci’s, but I hear that grey steaks and frozen chips were the norm. It sounds like hell. Or Beefeater. Either way, its not for my taste, or, it appears, that of the locals. Its gone. And good riddance, too. The people of Lichfield deserve better. In its place we have the aforementioned The Wine House, a bare bricked, wooden floored, restaurant that looks the part. Its ambitious – overly so at times – giving the impression that there is a very good restaurant lurking behind one that is still finding its feet. The menu is a large offering that extensively covers both land and sea, with plenty of room for impulsive splurges, such as a 7oz wagyu fillet at a pokey sixty five quid. A starter of beef carpaccio is well conceived. The thinly sliced fillet is of obvious quality, lifted and seasoned by a little grated horseradish and slithers of parmesan. There is further complexity with well dressed rocket and dots of pickled cauliflower. Yet at £8.00 for three slices, the value is debatable. There was no doubting the value of spring rolls, vivid in colour due to its generous filling of beetroot and goats cheese. Its all technically correct – the brik pastry is crisp, its interior properly seasoned – and we pile high the broken off shards of pasty with the last of the chilli jam, addictively hot and sweet. A take on yuk sung with duck is a success, though they may want to calm it down a little on the star anise. I liked it more with the chilli jam, but then I’d like most things more with it. Mains dropped the standard a little. Least notable was a pretty filo pie, generous in size yet unremarkable in flavour with its filling of halloumi and roasted veg. A lamb dish saw the rump served on the cusp of nearly being too rare, the meat magenta in colour and deep in taste. There was a second cut of braised belly and a fricassee of peas; the two elements providing the needed shade and light on the plate. I would have liked more of the sticky sauce, but that’s me just being picky; this was solid, assured cooking. A short rib pie was nothing of the sort, consisting of two whole ribs which required longer in the pressure cooker, mash, peas, and thick gravy with bacon and shallots. It encompassed everything that frustrates me about deconstruction. If the menu says pie, I want pie. At the minimum I want pastry. This was a homely dish that needs a little rework and a lot of rebranding. Too replete, we skipped dessert, though I was tempted by the black cherry panna cotta which appealed to me on every level. The bill, with too much to drink, was a very reasonable £40 per head – undoubtedly good value for the quality served. False promises of pie aside, there was little to dislike about the food we ate and a lot to admire. I’ll be back in time to see if The Wine House has grown into the restaurant that I hope it will become. Today I find myself north of Birmingham in Lichfield – a phrase I haven’t been able to say too often in the past. I am here for the holy grail of good company, good beer and good food. It is the food which I find most intriguing; I have come on the lure of a family run Italian restaurant where good pizza can be had. 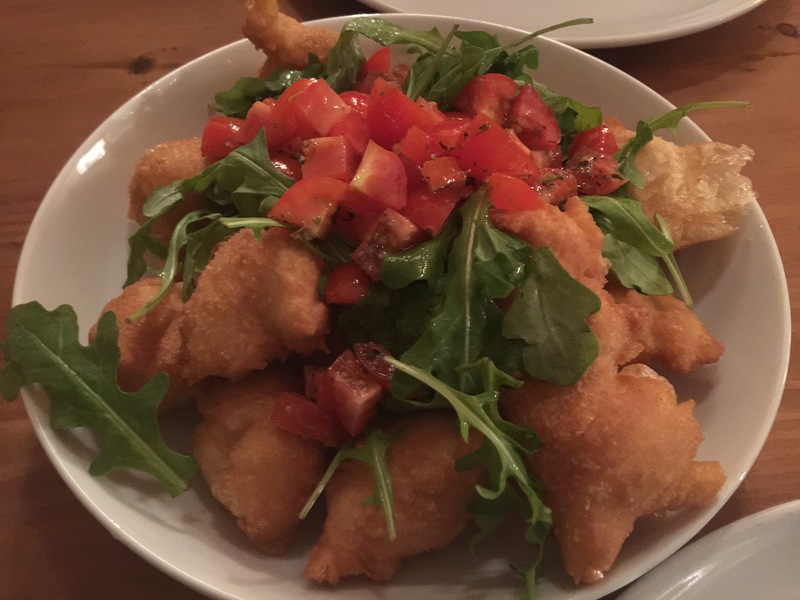 I have often bemoaned the state of Italian found in Birmingham – it’s the most poorly represented cuisine in the city and I am yet to eat in any in my home town that I would recommend to others. In Birmingham if you want good pizza you go to The Plough in Harborne. If home made, silky pasta is your thing, then I am sorry to have to break this to you, but you are in the wrong city. Pizzeria Margheri doesn’t look much at first. It’s a small room, with tired beige tiles on the floor and exposed brick walls. There are too many wooden tables for the cramped space and I imagine at full capacity the conversations of nearby diners become very much your business. It is a good thing that they take the food so seriously: They import as much as possible from their native Italy, from buffalo mozzarella through to hunks of cured meat which is sliced onsite. 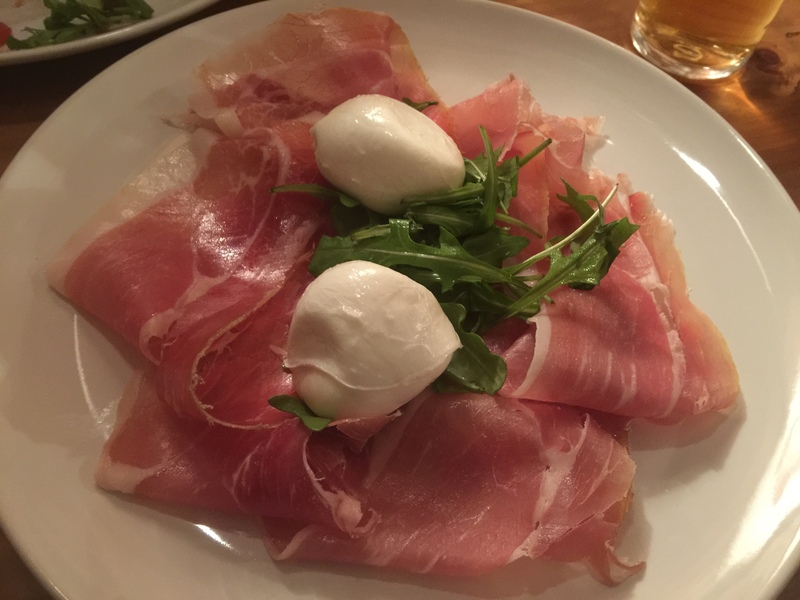 Its an expense that pays off; the mozzarella is young enough to still threaten your chin with its milk, whilst the proscuitto has a depth of flavour and glistening fat that we rarely find on these shores. With no cooking required the plate is an exercise in ingredient sourcing. They pass the test with aplomb. The aforementioned pizza is made with a sour dough base which we try in a couple of forms. First up is dough balls which are world away from the spongy tripe that they serve at Pizza Express. Here the dough is deep fried and non-uniform in size. There is a pleasingly high salt content and a chunky tomato salsa which pays thanks to the quality shopping again. Think savoury donuts for grown ups and you’re just about there. The pizza was a delight. Everything above board was well sourced, from more of the mozzarella to the discs of salami, but it was below decks where the hard work was done. The dough had been treated to a blitz through an oven which rendered leopard spots of char on the base. The crust was chewy, the centre correctly soupy. It is up there with a certain Franca Manca in London as the best pizza in the country. And all of this on a side street in a city that only qualifies as one because of a cathedral. The thirty thousand residents of Lichfield don’t know how lucky they are. Did I mention that they have a constantly changing pasta menu which I’ll be going back to try? Or that it is seriously cheap? Throw in a starter, main course and a few beers apiece and you’ll struggle to reach the dizzying heights of twenty-five quid a head. All of which makes the fact that we dined in a half empty restaurant on a Saturday evening all the more shocking. Maybe they need a fully-functioning website, or maybe they just need to relocate to my street so I can single-handily keep them ticking over. In a country full of chains serving faux-Italian, independents such as Margheri deserve to thrive for serving authentic food at a fair price. At last I have an Italian which I can recommend. Go try it for yourself, even if like me it is forty minutes on a train away.